Wisconsin Gov. Scott Walker (R) doesn’t believe the minimum wage “serves a purpose.” Yes, that’s what he told the Milwaukee Journal Sentinel editorial board Tuesday. 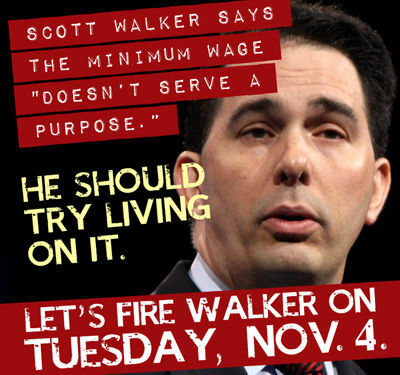 It should come as no surprise then that Walker also opposes raising the federal minimum wage from the $7.25-an-hour level where it’s been stuck since 2009. For the 700,000 Wisconsin workers who earn less than living wages and would like to be able to support their families, Walker has some sound and sage advice. He says those workers in fast food and retail and other low-wage jobs just have to get better jobs. He suggests welding. Hand me my helmet and spot welder. Then beam yourself up, Scotty. Obviously you’re from another planet. Here’s proof. Earlier this month, a group of low-wage workers filed a complaint with the state that the $7.25-an-hour minimum wage actually violates a state law that says the minimum wage must be a living wage. The department has determined that there is no reasonable cause to believe that the wages paid to the complainants are not a living wage. The group Wisconsin Jobs Now said after that decision that Walker’s “political stance against raising minimum wage is one thing. “But for the governor to brazenly say to the working families of Wisconsin that $7.25 an hour is enough to sustain themselves is not only misguided, it is incredibly ignorant and willfully obtuse. We agree. So does Mary Burke who is running to unseat Walker. Burke, who supports increasing the minimum wage to $10.10 an hour, said the wage law does indeed serve a purpose. “It’s important that people who are working full-time are able to support themselves without government assistance,” she said. That’s just sort of common sense. This article by Mike Hall is reprinted from the AFL-CIO Now Blog.